MK Dons manager Robbie Neilson was angry with his side's second-half performance, after they allowed a first-half lead to slip away all too easily in their 2-1 defeat at Doncaster Rovers. 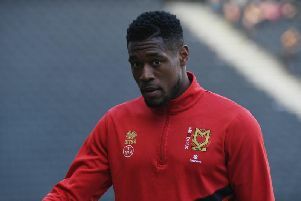 It really was all Dons in the first half at the Keepmoat Stadium, with the only frustration being that they were unable to add to the lead Chuks Aneke gave to them in the third minute. For the rest of the opening 45 minutes, they were first to every loose ball, they created chances almost at will and were barely concerned at the back by a Doncaster side who were booed off by their own fans at half-time. But the visitors went away from what had allowed for such a good display, conceding a sloppy equaliser before eventually being condemned to defeat by Matty Blair's winner. Neilson said: "In the first half, I thought we did everything we had spoken about doing. "We were direct when we needed to be direct, we passed it when we needed to pass it, we were up on the game, we kept high lines and we made it very difficult for Doncaster to get into the game at all. "We scored a goal, we had one chalked off, hit the post, we've missed chances and I think a second goal would have been a big turning point in the game. "But the second half wasn't acceptable - Doncaster changed their shape a wee bit and became very direct, very aggressive, got in our face and we didn't stand up to the game." The defeat allowed Doncaster to move within a point of the Dons, who continue to languish in the bottom half of the Sky Bet League One table after such a Jekyll and Hyde performance. It is an inability to sustain a good showing across 90 minutes that is really hindering them, and the fans who travelled to Yorkshire must have been wondering how they allowed the result to slip through their fingers. Neilson said: "We had aspirations at the start of the season to try and get ourselves promoted, but we're not consistent enough to do it. "The first-half performance, for me, was one of a top-two team, I don't think there's any doubt about it, so it is there. "The second-half performance was a mid to bottom-of-the-table team, so we have to get the consistency in our performance. "We have to get consistency in our decision-making and if we can get that then we're a good team, but at the moment when things turn against us on the pitch, we're not making the correct decisions."